Each week on Thursdays we highlight a trustworthy discipleship resource that can help you in your mission to make disciples. This week’s post is from Bible Studies for Life: How to Pray. Fill out the form at the end of this post by Friday, September 14th at 11:59pm to enter for a chance to win this free resource! Jesus came representing a kingdom totally unlike the political powers so familiar to us. Every aspect of our politics is scrutinized hour by hour to determine the popularity of our leaders and the percentage of constituents who agree with specific policies. But God’s kingdom doesn’t operate by popularity polls. God isn’t running for office. He is the King. Naturally then, in His Model Prayer, Jesus calls us to focus on His kingdom and His will. In one sense, the kingdom of God and the will of God sum up everything that relates to prayer. When we pray, we are calling on a King with power and authority to act on our behalf, and we’re asking for God’s kingdom to overrule the problems that seem to dominate us now. God’s coming kingdom promises the change we need is on the way. That’s a powerful incentive for prayer! So when we pray for His kingdom to come and His will to be done, we are intentionally surrendering our desires and self-interests to the powerful kingdom of God and to His plans. It is impossible to pray deeply until we surrender to the lordship of Christ and the rule of God. We struggle with letting go of our own will, don’t we? When a friend of mine was a child, he went with his father to a store where he spotted brightly colored bicycle handlebar streamers. He could easily imagine how cool he would look to the other kids in the neighborhood with those long, bright streamers flowing from the handlebars of his bike. The only obstacle was his father. When my friend tried to convince his dad how necessary those cool, new streamers were, his father was having none of it. The answer was a resounding No. That’s when things got ugly. My friend began to cry loudly and created an embarrassing scene in the local store where his family often shopped. The drive home wasn’t pleasant. My friend sulked in silence; worried about what he might face when he got home. But when they arrived at home, his dad opened the trunk and pulled out a brand-new bike! My friend was stubbornly demanding handlebar streamers for an old bicycle when his father had already planned to give him a brand-new one. We always benefit when we surrender our will to the will of our loving Father. His will surpasses ours in every way. He knows what we need, and He knows what is best. Excerpted from Kie Bowman, Bible Studies for Life: How to Pray © 2018 LifeWay Press®. Used by permission. Each week on Thursdays we highlight a trustworthy discipleship resource that can help you in your mission to make disciples. This week’s post is from Gospel Foundations Volume 1: The God Who Creates (Genesis), Session 1 God Creates. Fill out the form at the end of this post by Friday, September 7th at 11:59pm to enter for a chance to win this free resource! Why did God create? Was it because He was lonely? Because there was something deficient in Himself? To fulfill some need that He had? Far from any of these reasons. God created not because He was lacking but because He was overflowing—spilling over with the perfect fellowship between the three Persons of the Trinity from the very beginning. It’s not uncommon for people to misunderstand the nature of the Trinity—one God in three Persons—to mean that at creation, God was the Father, then in Bethlehem, God became the Son, and then in the Book of Acts, God became the Holy Spirit. This is not true and is actually an ancient heresy called modalism. Contrary to this, the Bible teaches that God has always and eternally existed in these three distinct Persons of Father, Son, and Holy Spirit. Even more, the Bible teaches us that God created everything through the Son and for the Son. These New Testament verses from the Book of Colossians work in concert with the account of creation from Genesis to show us this truth. This passage of Scripture teaches that Christ was “before all things,” which indicates that He is eternal. Christ is not created; He is the eternal Creator. Whenever the beginning took place, He was already there making everything become a reality. In John 8:58, while debating with the Jewish leaders, Jesus made it clear that He was preexistent and divine: “Before Abraham was, I am.” Christ not only created all things but He also maintains the entire cosmos. He sustains the order in the universe. He holds it all together. Doesn’t this give you hope? If He holds the universe together, surely He can hold our lives together as Christians! Whenever we are tempted to give up hope, to feel like we can barely “hold it together,” like the world is spinning out of control, we ought to remember that God is God and we are not. Jesus holds everything together by the power of who He is! Jesus is the perfect image of the invisible God, the only One who rules wisely over creation, perfectly relates to God and others, and through His work, earns our everlasting rest. By the Son, for the Son, and through the Son, all things exist and hold together. It is through Jesus that all things were created; it is through Jesus that all things hold together; and it is for the glory of Jesus that everything exists. The most basic implication this truth has for us is that we, like everything else in creation, exist through and for Jesus. It would be a drastic mistake for us, then, to read the story of the Bible as if we were the main character in Scripture. We are not. We are supporting players, and we only find true meaning and purpose when we align our lives with God for the glory of Jesus rather than trying to find how He fits into ours. When we read the Bible, then, we should not be asking primarily how this passage or text relates to me and my story. Instead, we must read Scripture as the revelation of God that we might know Him and His Son. Consequently, our question shifts from asking what these verses say about me and my life to what this passage says about God and His story, and then how we fit into that overall narrative. Jesus is the main character in Scripture. He is the center of the story. Everything revolves around Him. He is the perfect image of the invisible God, the only One who rules wisely over creation, perfectly relates to God and others, and through His work, earns our everlasting rest. By the Son, for the Son, and through the Son, all things exist and hold together. This article is an excerpt from Gospel Foundations Volume 1: The God Who Creates (Genesis), Session 1 God Creates. Gospel Foundations takes groups through the storyline of scripture in one year. 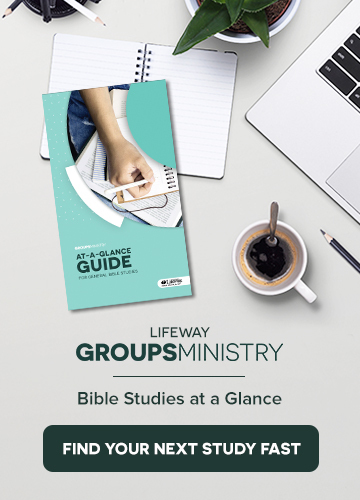 Learn more and preview three free sessions at lifeway.com/gospelfoundations. Fill out the form below before tomorrow night at 11:59pm for an opportunity to win a free bundle of this resource. The bundle includes 10 Bible Study Books and 1 Leader Kit.